What Type of Reaction Is Occurring When Sulfuric Acid Reacts With an Alkaline? How to Know if a Substance is a Reducing Agent or a Oxidizing Agent by the Periodic Table? Sulfuric and muriatic/hydrochloric acid are two strong mineral acids with a plethora of uses in chemistry laboratories. In terms of sheer mass, sulfuric acid is the single largest product of the U.S. chemicals industry. The annual production of muriatic acid is nowhere near as great, but it too is a key industrial chemical. 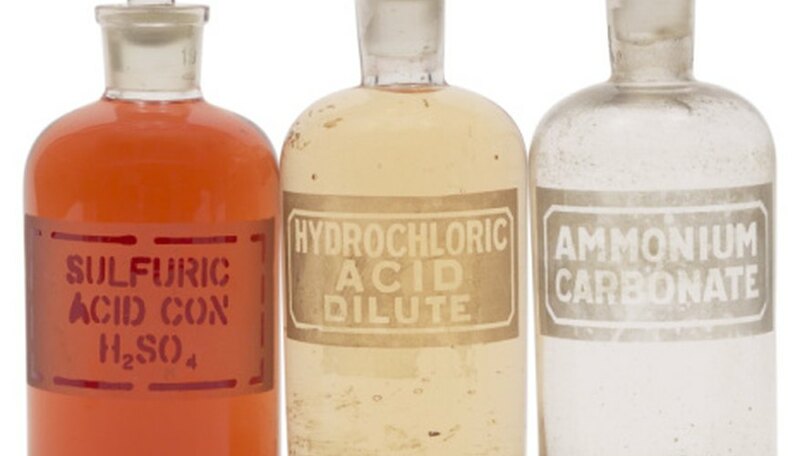 Muriatic acid and sulfuric acid are very different chemical compounds. Muriatic acid has the formula HCl, while sulfuric acid has the formula H2SO4. What this means is that sulfuric acid molecules have two hydrogens, one sulfur and four oxygens, while muriatic acid molecules have one hydrogen and one chlorine atom. Pure sulfuric acid (i.e. without water) emits fumes when it's heated because some of the H2SO4 is decomposing to yield water and sulfur trioxide. At room temperature in the absence of water, pure sulfuric acid is an oily liquid, while pure hydrogen chloride is a gas. Both compounds dissolve quite readily in water, and generally when you buy the acid, you are buying an aqueous solution of the chemical. 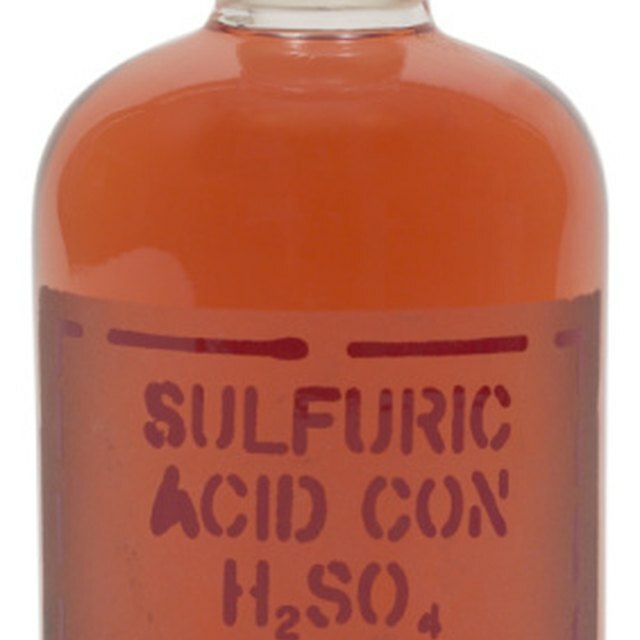 Sulfuric acid can give away two hydrogen ions, while muriatic acid can only give away one. Both muriatic and sulfuric acid are very strong acids and in concentrated solution result in a very low pH. Especially when hot and concentrated, sulfuric acid can act as an oxidizing agent, meaning it can take electrons away from other species in the reaction. Muriatic acid is not an oxidizing agent, although its chloride ion can act as a nucleophile, so concentrated muriatic acid can be used in organic chemistry to replace an alcohol group with a chlorine atom (typically in the presence of zinc chloride). The sulfate ion, by contrast, does not typically act as a nucleophile. Chemists often describe an acid's strength using a number called the pKa, which is equal to the negative log of the acid dissociation constant. The acid dissociation constant is a measure of the strength of an acid in water. The more negative the pKa, the stronger the acid. An acid like sulfuric acid that can give away two hydrogen ions has two pKas. The pKa1 for sulfuric acid is -3, while its pKa2 is 1.99. The pKa for muriatic acid, by contrast, is -7. Brennan, John. " Difference Between Muriatic & Sulfuric Acid." Sciencing, https://sciencing.com/difference-between-muriatic-sulfuric-acid-8463195.html. 25 April 2017.